This beaded bracelet is made with 7mm Grade A Matte Faceted Hematite and Green Malachite beads, featuring a silver feather charm. This beaded bracelet is made with 8mm Grade A Black Onyx beads and features a silver plated Ti.. This beaded bracelet is made with 8mm Grade A Lava Beads and features a silver feath.. 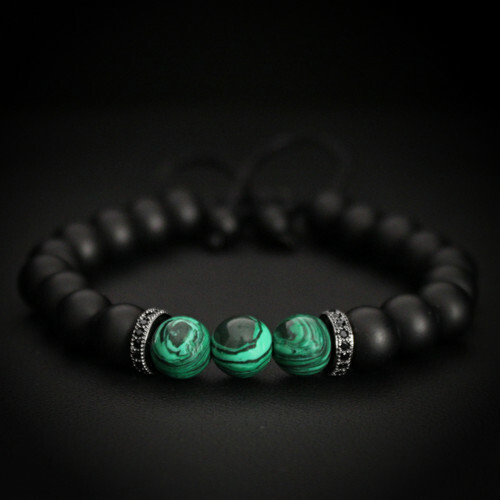 This stunning bracelet is made with 8mm Grade A Black Matte Onyx and Green Malachite beads, featuri.. This handmade bracelet is made with 8mm Black Onyx Stone Beads featuring Rose Gold Tiger charm.. This handmade stretch bracelet features 8mm Matte Black Onyx, Gray Jasper with Black Veins and Gunme..